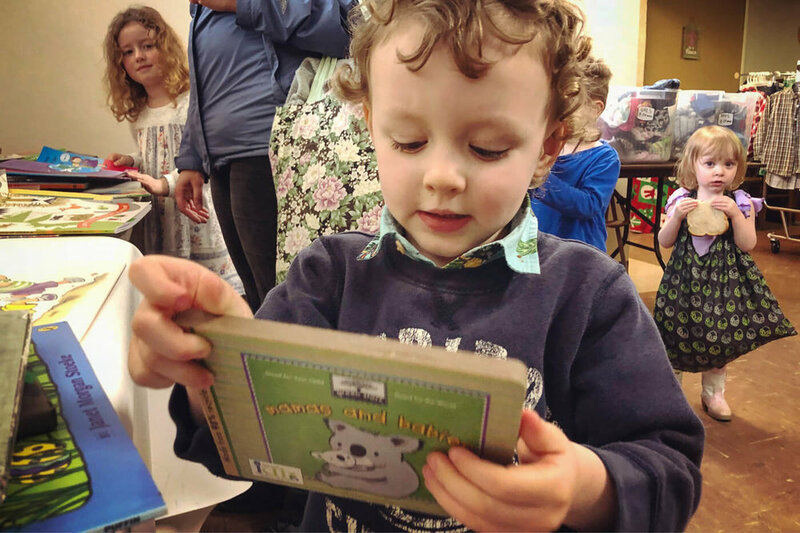 For the first time ever we added books to the exchange…and it was big hit with the little readers. While their parents looked for new clothes, kids picked out new books to call their own. We hope to expand and offer a greater selection of books for grown ups in the future. A huge thanks to the Children's Book Bank for getting us started and sharing our love for reading. It was the good kind of hectic at the beginning, as folks started showing up around 1:30pm to get first pick, but everyone was patient and many helped sort and hang the mountain of donations that we had to go through before the doors even were officially opened. By my count, the Spring Exchange saw about 48 individuals and upwards of 10 volunteers mingling about. I didn’t get a first timer count, but I’d estimate roughly half the attendees were there for a the first time. The addition of 3 new racks helped relieve the pressure on the women’s clothes section, which in the past were packed so tight you'd need a pry bar to pull a blouse from. The Children’s Books Were a Huge Hit With Kids and Parents! A handful of exchangers brought books, so the grant from the Children’s Book Bank really helped in terms of getting things started. I didn’t get a count of how many books went out, but just about every child left with 2-3 books in hand. And throughout the event kids were reading. It was so great! Let's keep the book exchange going. It'll be a regular part of our events. We'd like to see it expand to offer more books for adults as well as kiddos. So…if you have any books that you've already devoured and would like to share with a neighbor bring them along with you to the next exchange on July 1st. A trio of Friendly Exchange volunteers help sort and hang incoming clothing items so that you can get out there and shop for new threads faster. We hope no one misses any of the upcoming exchanges this year, but if you do, then you won't have to wait so long before the next one, as they'll be happening on the second Sunday of every odd month. As always, you can look for the yellow signs and the email alert beforehand. As you know, the Free Clothing Exchange is an all volunteer-powered, community organization. Even the space we meet in is donated by the amazing folks at Kenton Church. We're able to expand the frequency of the event now, not because I suddenly got more time on my hands, but because of an influx of volunteers from Mosaic's Neighborhood Communities and because so many of our own Friendly Exchangers stick around and volunteer at each event. Thank you all for your part in making this truly an event that's not just FOR our community, but BY us as well.